Ohio River Bluffs is an Arc of Appalachia preserve located west of Manchester, Ohio. It is a forested property including the steep-sided hillsides bordering the Ohio River along an elongated stretch of Highway 52. Outstanding Native Ecosystem Protected. 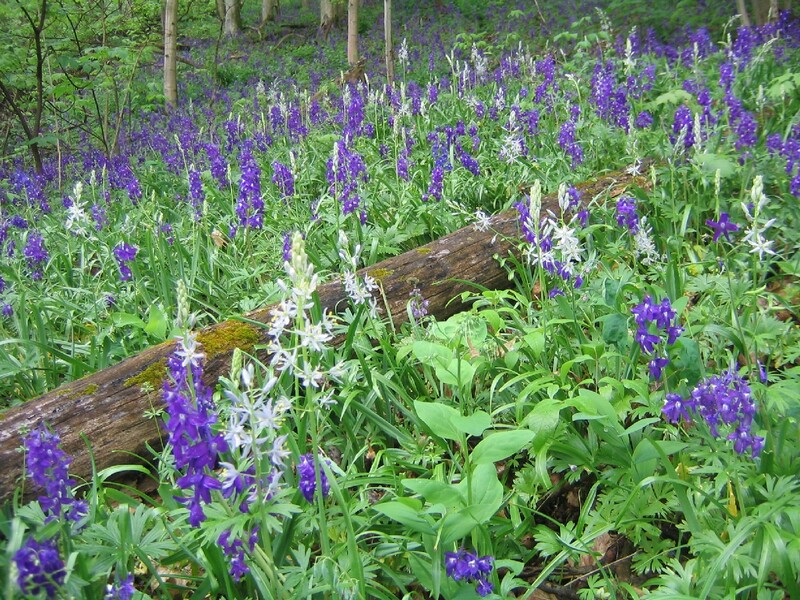 The Ohio River Bluffs is an outstanding example of a classic Ohio River corridor forest with its high density of spring wildflowers – a distinctive mix of species that was once the hallmark of the Ohio River’s steep bluffs lining the river corridor where Silurian bedrock bedrock is exposed. This is the same Silurian bedrock that supports the noteworthy wildflower displays of Whipple State Nature Preserve and the Arc of Appalachia’s Highlands Nature Sanctuary. The Bluffs is arguably the most splendid and showy wildflower display oft them all – at least for ten very special days of the year. Fantastic Wildflower Displays. Ohio River Bluffs has a wildflower display so spectacular that it is not unusual for automobiles passing by to pull off US-52 to pause to take in the magnificent view: a long stretch of steep bluffs covered with a nearly solid carpet of wildflowers from the base to the ridgetop. The species diversity is not particularly high, but the density of flowers is stunning – almost overwhelming to the eye. The most common flowers for the site include: Virginia Bluebells, Blue-eyed Mary, Toad Trillium, Dwarf Larkspur and Wild Hyacinth. The viewshed from the top of steep limestone bluffs southward is equally attractive. As one stands in drifts of Twinflower, one can see the sinuous sweeping curves of the Ohio River below, and further beyond, the hills of Kentucky. Natural History and Interesting Species. The entire tract is forested with a rich mixture of diverse tree species, including white oak, sugar maple, red oak, elm, hackberry, Kentucky coffee tree, and white ash. 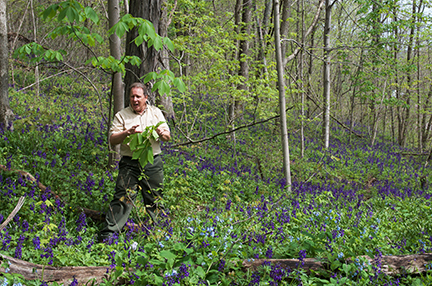 The understory woody layer is dominated by young buckeye trees. The forest was timbered but was done very selectively, leaving the canopy relatively intact and the rich soils undisturbed. This little jewel of a preserve just grew a whole lot bigger! Dayton Power and Light Company, which has historically operated coal-fired electric plants on the Ohio River not far from the Bluffs, recently donated 175 acres of forested hill-country immediately adjacent to the original preserve. The Bluffs is now 270 acres in size and even includes a stream corridor running all the way to the Ohio River! Visitor Access. The Arc of Appalachia is currently fundraising for an 8-acre expansion of the preserve that would make for an ideal location for a proper trailhead for the preserve. This would facilitate hiker-access to the expanded nature trail system we are planning for the preserve region in the future. 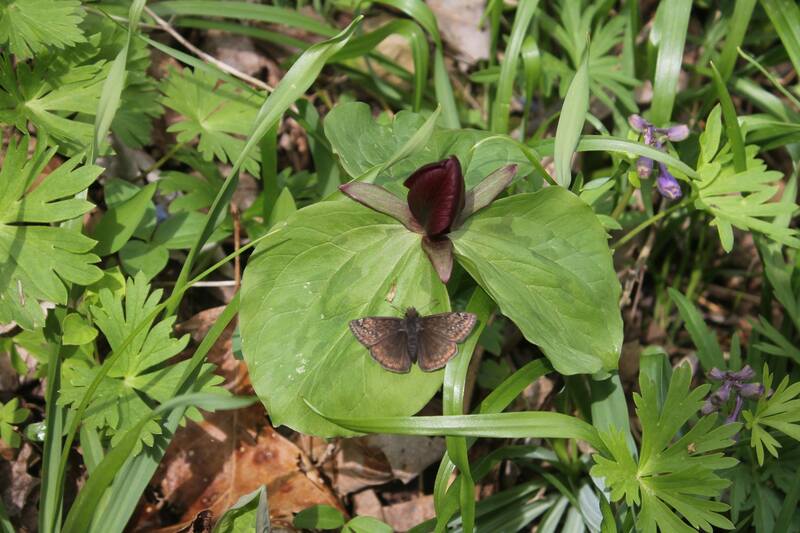 In the meantime, the best way to visit the Bluffs is during our annual Wildflower Pilgrimage in mid-April each year. See Calendar of Events. Learn more about the Land Campaign here.